A frame-by-frame videotape analysis of Tiger Woods at the 2005 British Openshows the effects of his work with Hank Haney. To illustrate the differences (and what has remained the same), we compare his 2005 swing (after he worked with Haney) with his swing from the 2002 Masters Golf Tournament(prior to Haney). Let's begin our analysis of his swing from down the line. Here are photos of his address with his driver at the 2002 Masters Golf Tournament and his 3-wood at the 2005 British Open. His spine angle (35 degrees) is identical. 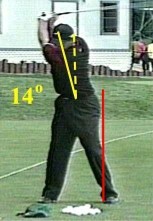 His swing plane is steeper in 2005 (it was 49 degrees in 2002 and is now 60 degrees in 2005) because his upper arms now hang more vertically, bringing his hands closer to his body (or more likely, he has brought his hands closer to his body so that his arms hang more vertically). As a result, he tees up closer to the ball, producing the steeper swing plane (line from the ball to the middle of the right shoulder. The red line indicates the position of the top of his head at address. Tiger is now bringing his club and hands more inside his swing plane than he did in 2002. We feel that there is greater accuracy and safety in keeping the hands and club as close to the swing plane as possible during the backswing and downswing. A good example of someone who keeps his hands and club close to his swing plane is Fred Funk, who leads the tour every year in driving accuracy. Both these photos show that Tiger decreases his spine angle (stands up) at the top of his backswing, and, at the same time, lowers his head. There is one degree less change in 2005 compared to 2002, which is better. The more stable the spine angle, the easier it is to bring the center of the clubface back to the ball. In other words, the less variation in your spine angle during the swing, the more accurately and consistently you can strike the ball. In both photos, Tiger has his left hand on his swing plane and his left arm very close to it, both of which improve accuracy. In both these photos, Tiger is bringing his hands and club down well under the swing plane, but his hands are closer now to the swing plane than they were in 2002, which is a good thing. Unfortunately, Tiger continues to pull his head down on his downswing. 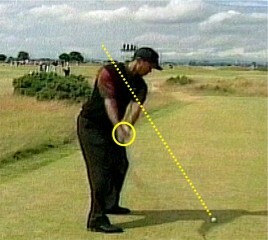 He does this because he is using his stomach muscles, especially on his right side, to pull the club down to the ball. This is an old habit of Tiger's, but it may now have become a physical problem as well, as we will show below. 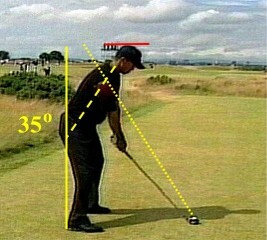 In 2002, Tiger had to really decrease his spine angle (stand up) at impact (from 35 degrees at address to 24 degrees at impact) because he let his arms 'go ballistic' at impact. Letting the arms 'go ballistic' is a good thing. A clubhead going over 100 mph pulls on the arms with 100 lbs of centrifugal force. As we know from experience, if you try to fight the forces of nature, you will eventually lose. This is why it is better to 'go with the force' than fight against it. In this case, the force is centrifugal. In 2005, Tiger does not have to change his spine angle so much (from 35 degrees at address to 31 degrees at impact) because he is now resisting the centrifugal force with the muscles of his forearms by holding his wrist angle (the angle between the forearm and club shaft). This is most likely due to his new instruction. It is an attempt to improve his accuracy by keeping the club shaft on the 'shaft plane', a line represented by the club shaft at address. It works, but at considerable cost. There are a number of well-known golfers who tried this strategy, including Sam Snead, Ben Hogan, Bernhard Langer and Lee Trevino. Golfers who know their golf history realize that these golfers all suffered from the yips later in their career. Is there a connection between keeping the shaft on the 'shaft plane' and the yips? There is. To maintain the same club shaft angle at impact that you had at address requires that you overuse the muscles of your forearms. You can get an idea of the effort required to fight 100 lbs. of centrifugal force by holding your driver or fairway wood at your address position and have someone pull down along the length of the shaft. After a few minutes of this, you will feel your forearms shaking from the effort. Well, the same thing happens when you swing the driver or fairway wood, only it happens in a fraction of a second. But it happens every time you drive the ball, whether on the course or on the range. We know what happens when muscles are overused. They develop microfibers, a mild type of scar tissue that forms in the connective tissue between the muscles, as a result of any injury or overuse. By the way, you can learn more about microfibers at our Somaxsports.com web site. To see the results of releasing microfibers in golfers please see the Clients page. Microfibers not only bind the muscles together, they also bind tension into place. In addition, microfibers do not go away after they have formed. Instead, they tend to accumulate over time, making golfers stiffer as they get older. This is why the yips show up later in a golfer's career. To avoid the yips, it is better, in the long run, to go 'with the force' rather than against it. You will get some improvement in driving accuracy in the short term by keeping your shaft on the shaft plane, but you will eventually get the yips, which are no fun at all. We recommend to our golfers that they improve their ball striking by simply bringing their hands up to their swing plane at address, and then go ballistic on the downswing. You can demonstrate this for yourself at home by teeing up in your usual manner, and then extend your arms until your arms and club are in a straight line. You will see that your clubhead slides about 6" away from you. Therefore, on your downswing, you will need to decrease your spine angle (stand up) to compensate for this 6" extension brought about by centrifugal force. If you extend your arms at address, you will have no need to change your spine angle at all during your swing, and you will strike the ball more accurately without courting the yips. Here are the same photos again so that you can see how much Tiger pulls his head down while at the same time straightening up his spine! It is a credit to his hand-eye co-ordination that he can play as well as he does, given the extreme changes in his spine and head position during his swing. What could he achieve with a stable spine and head position? In the above photos, you see quite an improvement from Haney's tutelage. 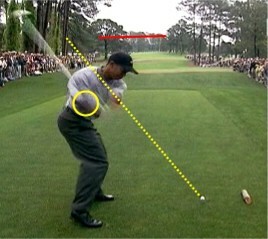 Tiger's driver is much more on plane after impact than it was in 2002. 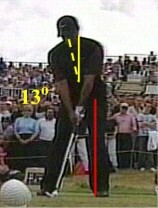 Now, lets look at Tiger's swing from the front. Unfortunately, we were not able to find any shots of Tiger's driver or iron from the front during the 2002 Masters, and we only found oblique pictures of his iron during the 2005 British Open. We did find some pictures of his range practice with his driver in early 2004, so we will compare the 2004 driver to the 2005 iron. Not the best choice, but it will have to do. At address, Tiger's spine appears to be tilted more to his right now than in early 2004. This could just be the result of an oblique angle, so we will confine our remarks to the change in spine angle during his two swings. 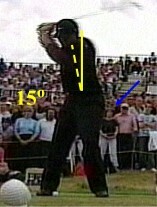 The red vertical line shows the movement of his hips during his downswing. We feel the hips should stay inside the left heel during the entire swing. This allows the golfer to maintain a consistent front spine angle during the swing, which results in more accurate drives and irons. Tiger's spine angle at the top of his backswing has changed less in 2005 (from 13 to 15 degrees) than it did in 2004 (from 10 to 14 degrees). This is good, and is undoubtedly as result of Haney's instruction. 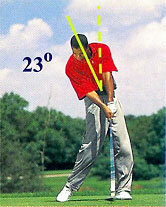 However, Tiger continues to start his downswing by shifting his hips to his left. You can see this in the third photo above. 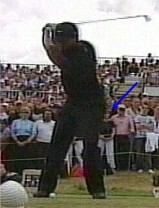 The woman's face in the gallery is partially covered (blue arrow) by Tiger shifting his hips to his left. 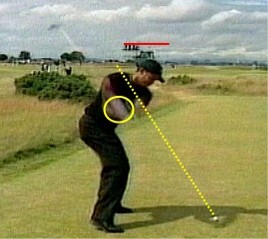 This was a move popularized by Ben Hogan and is taught by many teachers. The problem, as you will see, is that this forces a change in the front spine angle. 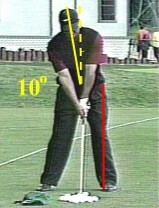 The excuse for shifting the hips to the left is that it allows the golfer to turn his hips. This is just not true. In fact, the opposite is true. The more time you spend shifting your hips during your downswing, the less time you have to turn them. 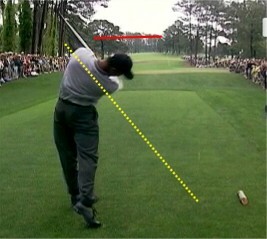 In the far left photo above, you can see why Tiger has had such a problem pushing his drives to the right. 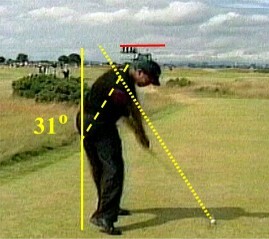 A spine angle of 29 degrees opens the club face. You can demonstrate this for yourself at home. Take your address position and tilt your upper body about 30 degrees to your right. You will see your club face open, which will push your drives to the right. Tiger tries compensating for this with his hands, but sometimes has overdone it, and he hooks his drive to the left. To improve driving accuracy, you want to maintain the same spine angle at impact that you had at address. This will help you bring your club face back square to the ball. In the second photo, taken from the 2005 British open, you can see that Tiger's spine angle is now more vertical, but his hips are sliding more to his left. This is a case of correcting the symptom while leaving the cause untreated. In the third photo is Tiger's old swing, which is much better. Less sliding, a more vertical spine. Also notice that in the third photo Tiger's hips are more open at impact. When you waste time sliding (Tiger now slides for 3 1/30ths of a second), you lose time turning. Sliding is a very weak movement and adds precious little force to the swing. Hip rotation, on the other hand, is the real source of power for the swing. Tiger has most likely stopped rotating in a effort to lessen the force on his left knee. He developed a painful cyst at the back of his left knee, which caused a change in his swing and posture. This cyst developed, we believe, from his habit of hyper-extending his left knee to add some 'snap' to his drive. He may also have less hip rotation from lifting weights. Lifting weights is a well-known way to develop microfibers. Lifting heavy weights actually tears the muscle fibers. This is experienced as muscles soreness after lifting. Microfibers form in the connective tissue around the torn muscles to help in the healing process. While the microfibers form right away, it takes a couple of years for them to accumulate enough to restrict flexibility. When you lose flexibility, you have to change your swing. We believe Tiger has lost hip rotation in part due to his heavy lifting. The two golfers most identified with weight lifting are Tiger Woods and David Duval, both of whom saw their games decline a few years after starting lifting. Most of the work we have done with professional and amateur golfers is releasing microfibers caused by weight lifting and running. To make up for his reduced hip rotation, Tiger has come to rely on his stomach muscles, especially his right obliques, to accelerate the club on his downswing. This accounts for his head dropping down on his downswing, and the change in his front spine angle, as the contracting right obliques pull his spine to his right. Above is a drawing of the right oblique muscle. This thin, wide, flat muscle connects the lower ribs to the pelvis. When a golfer restricts the movement of his hips (from lifting weights or by volition), he often recruits the right oblique to compensate. Unlike the hips, this muscle is not very large and can easily be overused. It becomes sore, and microfibers, a mild form of scar tissue, form around the muscle so it can heal. Once the muscle recovers, the microfibers not only do not go away, but they tend to accumulate over time. the right obliques are stiff and tight, the golfer tends to start his downswing with his right obliques. 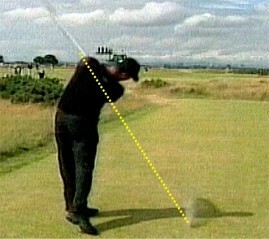 The causes a ducking motion and slightly opens the clubface prior to impact, pushing the ball to the right. 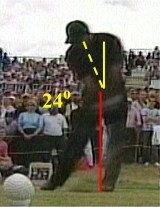 Both of these problems were apparent in Tiger's swing mechanics during theUS, British Opens and the PGA Championship. They were not apparent during or prior to the 2001 Masters Golf Tournament. In sum, we see some beneficial results from Haney's instruction (more stable spine angle, club more on the swing plane during follow through) that are evidenced by Tiger's brilliant wins at the 2005 Masters and British Open. But we are concerned about long term problems (yips) from keeping the shaft on the shaft plane. And we see continuing problems of hip shift to the left, reduced hip rotation and the resulting change in front spine angle that we think will prevent Tiger from reaching his full potential as a golfer. You can easily and inexpensively videotape and analyze your own swing and putting mechanics with our new book, The Efficient Golfer! If you are working with a junior golfer, this is an ideal way to get them off to a good start in golf.